There are generally 4 types of art I do for Caedes.net, 5 if you count pen and ink. Since only two works are allowed in the contest, I chose first to go with my traditional layout/design/abstract works. This may be too garish though. This is really great and I love the colors! haha, Mary thx for the comments, I was nervous about the colors... and bjb lol I like your comment. It's funny how the tables turn, turn, turn, turn. what prog did you use to make this pic? nice job! that's really neat, i like the colors too, alot! i would also like to know what program you used to create this. I am who I am becuase of the Great I AM! oh sorry i didnt even see the comments asking for what program-- i did it all in photoshop, and no special filters. Well done for your placing in the competition. The use of pastels and confetti notes were delightful. Melting was a nice touch. I played trombone for 7 years, and I know what it's like to have everyone listening to the woodwinded treble clef. But I liked it this one anyways ^_~. "A Tidy Bedroom Is A Sign Of A Broken Computer"
oh wow wicked image! cool colours! how DID you do it? This image is great and colourful image! I really like it, make more please! Kittens are cute...artwork is neat.Do you like my icon? Sweet! I love the wild colors! I'm unique...just like everybody else! Very cool... though I do agree with Micheal, why does everybody Make the treble clef the simble for music? 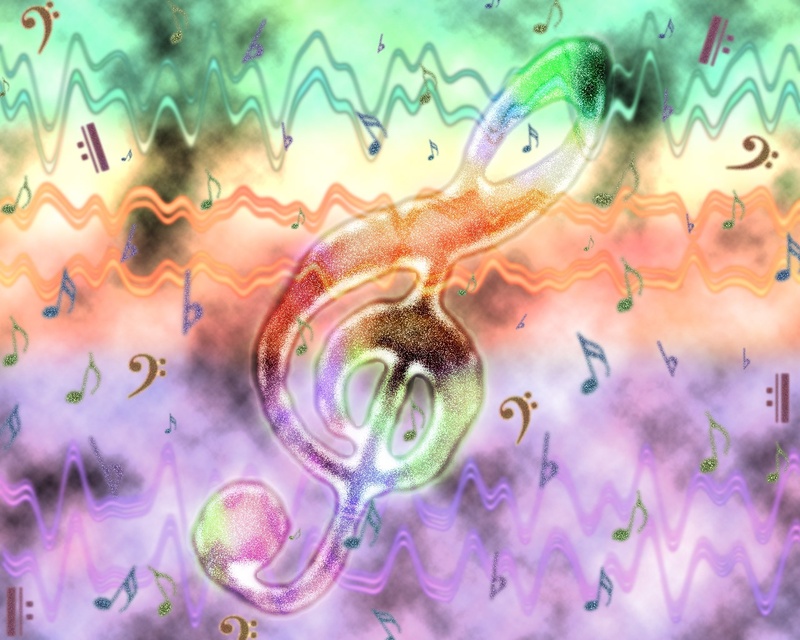 other than that this a very neat image, the colors are well blended and the spray paint look on the clef is really neat. there are so many interesting aspects to this it's really wonderful to look at. LIKE THE COLORS, VERY CREATIVE. Awesome colours!! I like this...well done!! Love the fluidity of this, feelings of summer with the waves of fine music buzzing along in the warm breeze. Crazy doesn't even begin to cover it..